If you have read my Five Tips article, you know that I strongly encourage everyone starting out in the business to look for work on the highest budget, most prestigious projects that they can find, including internship opportunities with well known and respected people – regardless of how lowly the position you take. “If you are going to sweep someone’s floors for free, you might as well sweep Steven Spielberg’s”. You also know that I discourage you from working on student films – that is once you have graduated from film school – and micro budget projects – unless you already have a prior personal connection with the director or producer, or the project itself is truly intriguing and different (probably festival bound). I’m going to talk more about these exceptions in another post soon, but the summary is “don’t do it for career reasons- it’s only worth it for personal ones”. But what about low budget? One to three million dollar fodder for basic cable or direct-to-DVD (video as it used to be when Blockbuster still had brick-and-mortar stores), that expects to make its money back on international distribution over time. The truth is that there will always be more people coming into the industry who are just like I was 19 years ago – people with a strong belief in their own creativity, with skills but few credits, and having taken bad advice to heart about their career path. The somewhat good advice I got was “it’s not what you know, it’s who you know” or to express that in more modern terms – network, network, network. But the bad advice that I heard, and read in several sources, was that I should position myself as what I wanted to be, in my case a Production Designer, do that department head job as soon as possible, and that the projects would get bigger. Naively, I did just that but the projects didn’t get bigger. The first time I asked for a small pay raise on the next movie, on the strength of prior good, money-saving work for the company, I was let go. Wages and personnel fees are one of the biggest costs in making any movie – and I would go so far as to say that in low budget films they assume an even greater proportion of the final budget. One of the problems with working in low budget consistently is that you get into the habit of being frugal, up to the point that your ideas start staying small. Even when there might be more budget available, your ideas can stay stuck. It doesn’t occur to you to pay an artisan to build something amazing, because you become used to cobbling something together yourself. Sometimes it works out well, and you have a moment of pride in knowing that the amazing looking stairwell was your clever cardboard and sticky tape contrivance in a closet. However there is always that caveat – “it looks great for a low budget movie“. 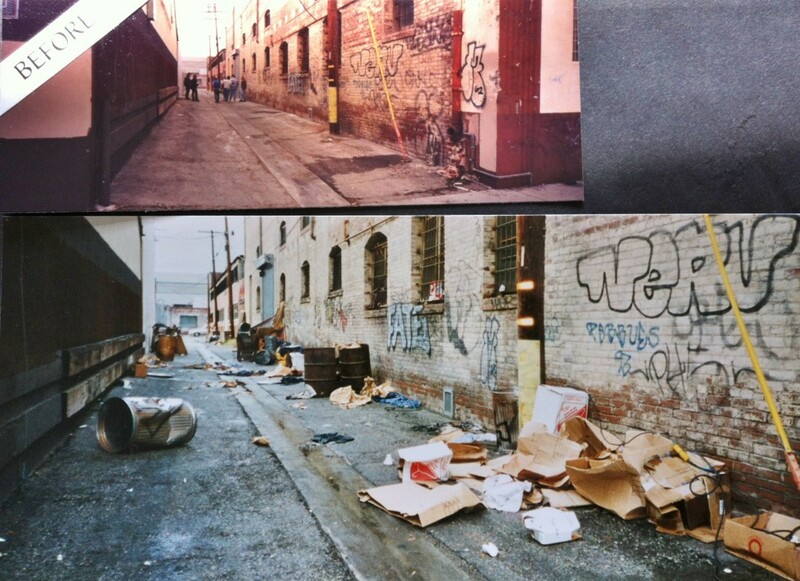 Here’s a pic from my Set Decorating portfolio – the before is of the nice clean alley, while the bottom shows the dressed alley – which was used for a nice fight scene with stunts, as I recall. Now this was relatively easy to do on a budget! Some of the local homeless folk were pretty curious as to what we were doing. At one point it started to rain and my crew and I had to take shelter in the little shack we had made. Yesterday’s Target (1996) – one the higher budget movies from my credits. In low budget compromises are constant, starting with the script. The original vision might be for a sweeping vista (actually 2nd unit location shots are some of the most economical – great ROI) and a complex multi-location montage – but you end up having to settle for a stock shot and a single set up. There were many times when I stood with the Director and Producer and outlined the costs (pared to the bone) of creating two sets, but we didn’t have the budget for both so you pick which has the most value to the story. Often locations were chosen based almost entirely on price. New filmmakers quickly use up all their favors with their friends – using friends’ homes, gardens and garages as locations for free. But even with paid locations, the ones that are the lowest price are often only “almost right”. I remember the time on-set dressing, I was asked to “hide the swimming pool” outside the picture window because it was too luxurious for the character. I managed it with a lot of judicious moving of potted plants and some sleight of hand. Being in an “almost right” location restricts what every department can do, especially what shots can be designed. Now this director really had kind friends. 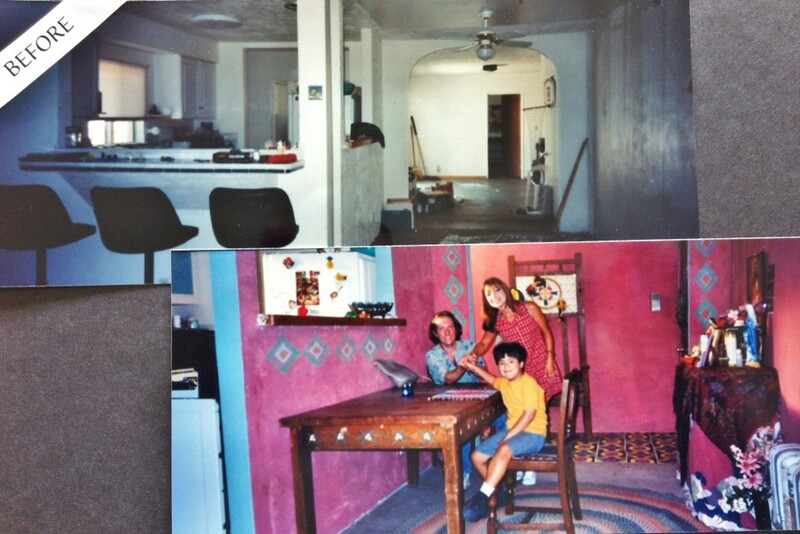 They were in the process of renovating their home and allowed us to do some pretty outrageous scenic painting to make their house look like an apartment. Note the tiles – color copies under clear contact paper, and the old heater – a free standing rental item. The big job was actually repainting their dining room back to white. I am forever grateful to my crew who went back to attend to that. I did say “are you sure it’s ok?” a few times. 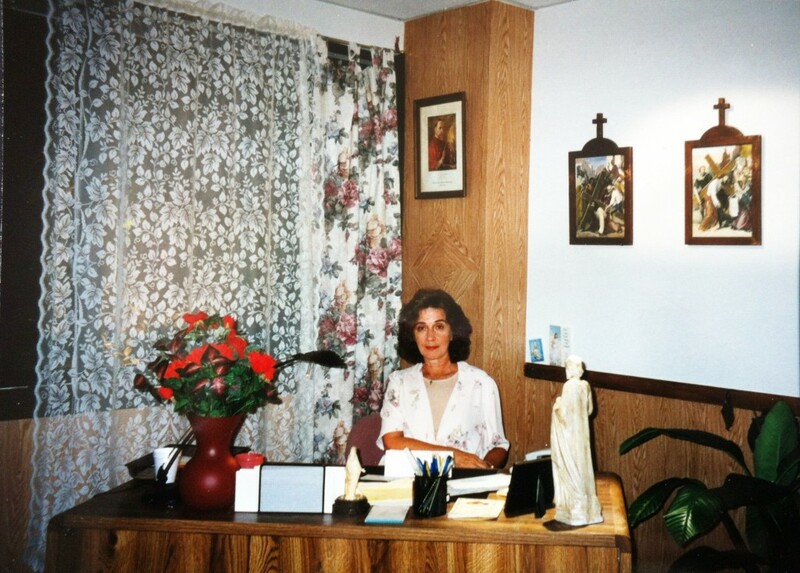 People can be saints when it’s for a movie. Stigmata .44 (1996). Pictured: Director Nick Goodman, Actors Paul Robert Langdon and Elena Sahagun. There is the pervasive belief that low budget=restrictions=more creativity. That can be true, but I notice that this idea is expressed chiefly by people hoping to justify making movies without proper budgets, to draw you in to work for them for free. It does take extraordinary creative thinking to come up with ways around limitations, to come up with good, innovative solutions in the face of restrictions. So what happens when the creative thinking is ordinary, run-of-the-mill, not particularly new? In other words, what if you are in the “low budget rut” – your ideas have become small, easily repeatable, because “how much will this cost?” has become your first question. In filmmaking time is a huge factor. Most people with budget limitations – say product designers or engineers creating a new product that has to be a certain price – tend to take a long time developing their new product. The ingenuity is lovingly developed through many iterations. In filmmaking, time is most definitely money; in low budget, time is at a premium. The budget is in the details. Watch any reasonably budgeted movie and look for the transitional scenes. These will be moments when a character is walking somewhere, parts of a montage, establishing shots, moments. They add to the richness, the veracity, the atmosphere – perhaps very little to the story, and more to the milieu or our understanding of the character. These 1/8 page moments in unique sets are the first things to disappear from a low budget shooting script. Count the set ups in a scene. These cost money, because they cost time. In low budget they can’t afford the time for many different set ups – although sometimes a bit of restraint would be helpful for clarity. Nor can you afford in low budget to waste money on things that will not be shot. This particularly applies to art department. Often it means pre-planning (which is good when it works) – but it also means having to say no to the Director (awful feeling) or as happens more often, having to cobble something else together on the spur of the moment (one of my fortes as an on-set dresser I’m almost sorry to say) when they realize on the day that they really do want more angles for the scene. Here’s my photo of an example of a low budget one angle set, from “Man of Her Dreams”(1997). You can see the edge of the window drapes. This depiction of an office of a parochial orphanage was set up in a corner of a room. That “wood” paneling – pretty obviously contact paper. I believe the actress pictured is Sarah Hunley, portraying Marie Helene. The other big reason to make a 360 degree decorated set is that actors LOVE it. They will walk around the set, noticing little things you put there about their character inspired by (possibly transcending) the script. They will absorb it and use it to enhance their performance somehow – even if it is never seen on camera. Speaking as a designer, it is so rewarding when that happens. One of the great tricks in low budget filmmaking is to write a juicy minor character – limited locations, limited shoot days – that will appeal to a more established star. Star power is huge in marketing/promotions. The star might be someone a producer knows or has a connection to, who will support the project for their own “giving back” reasons. Or it might be that the value such a star brings, the star’s caché, is worth devoting a substantial portion of the budget to that one shoot day. Stars do bring value – they may even be willing to do a bit of publicity for the film – especially if you can shoot a sit down interview on the set the same day they come in to shoot their 1 1/4 pages. But here’s the thing – the production value and quality has to match the aesthetic value of the Star – not just for the scenes in which the star appears – but for the rest of the movie too. I don’t only mean the art department where it is most noticeable – I mean everything – the quality of the writing (if you can write well enough to attract a name for that scene, then do it for the whole thing! ), the costuming, the props, the lighting, the acting. Case in point – I remember when a certain mid-level star (nice man) arrived to do his bit part playing a wealthy crime boss. The prop master had a selection of supposedly luxurious looking watches for the character to wear. The star glanced at the tray, then held out his wrist and said, “How about I wear mine” – a whopping gold and diamond studded Rolex. It made the other nice looking watches look like they came from Cracker Jack boxes. There is a saying that I have found really does apply: Good, Fast, Cheap – pick two. In low budget the usual choice is Fast and Cheap – and you make it as Good as you can, settling for “good enough”. Eventually the knowledge, deep down, that your work is not as Good as you wish it were, that you are not in a pursuit for Excellence, burns your soul. We who love filmmaking are all artists, working in our chosen medium. Love of filmmaking can only sustain you for a while. People get burned out working in low budget consistently because of the constant compromise, the constant diminution of your vision, the constant debates, the constant sighing for what might have been. A cursory check of the IMDb of my low budget movies reveals how few of my colleagues from those days are still in the business at all, let alone making a success of their career. If you are going to work on a low budget film, for whatever reason, it’s important to watch yourself for those bad habits creeping in – bad habits of practice and bad habits of thought. And move on to bigger things as soon as you can. They don’t settle for “good” at Pixar or Amblin or Playtone, do they? Next How’s Your Portfolio Looking?